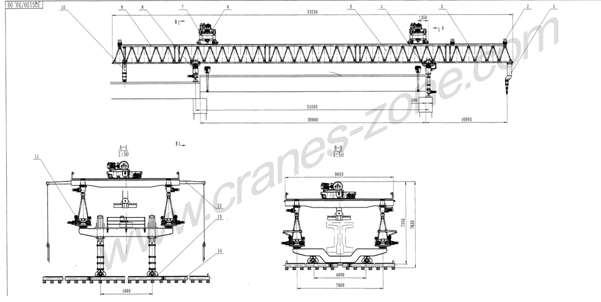 Truss Launching crane/beam launcher is an important machinery for building high rise constructions, bridges etc. These beam launchers can handle cat-in place concrete, as well as prefabricated elements, hence they are highly adaptable for varied spans and types of superstructure. With sophisticated design & fabrication, these launching girders are itself a steel structure, which moves forward on the high rise constructions or the bridge piers span by span. With varied launching capacities and heights, our range of launching girders are made from quality material, ensuring durable and reliable performance. 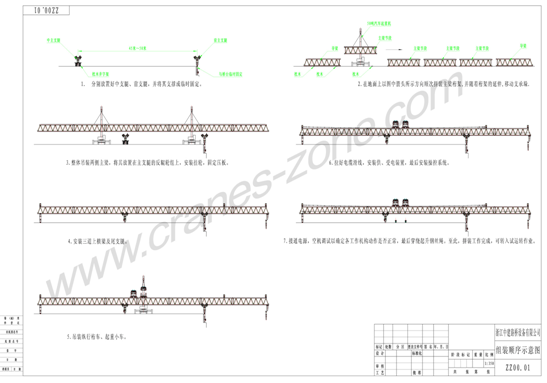 a) Apply the latest separate pinned structure of triangular space truss to main girder, so as to improve the stiffness and strength of whole crane. b) Main girder is made of Q345 high strength steel, and melt into the latest design to ensure the main girder can work under high strength mode safely. c) ZHONGJIAN brand launching crane is pioneering in continuous one time operation during bridge launching progress in China. It is of the most complete function launching crane for single machine domestically. 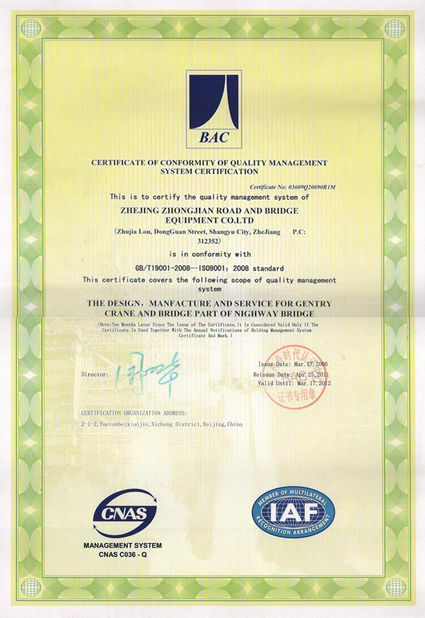 d) Compared with similar products from other supplier, ZHONGJIAN brand launching crane have its unique design concept to the most difficult hole-span during bridge erection, in the way of laying side beam. So, it is safer to operate under high difficult and risk condition. 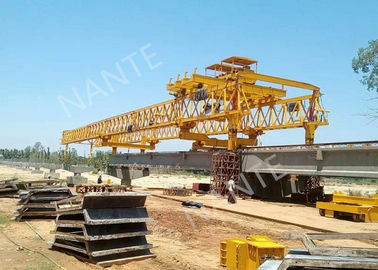 e) Powerful front, middle beam and three transom crane connect together to ensure transverse stability during bridge erection fully. f)There is separate stroke switch control to each traveling mechanism, so as to decrease mutual collision between each traveling mechanism. g) Overload resistance system: there is high performance weight limiter on two sets of trolleys, so if the lifting girder is overloading, the weight limiter will stop it at once. h)There are normally three legs from other supplier. But we have four legs, including one front leg, one middle leg, one rear leg and one temporary leg. i)Apply inner shrink leg to one time erect side beam in position and have more safety. a) Strictly execute standard painting process to ensure blasting and painting quality. b) Apply H steel enclosed section for main girder chord. Web chord is made by customized square tube to realize enclosed welding, which can avoid inner rust. 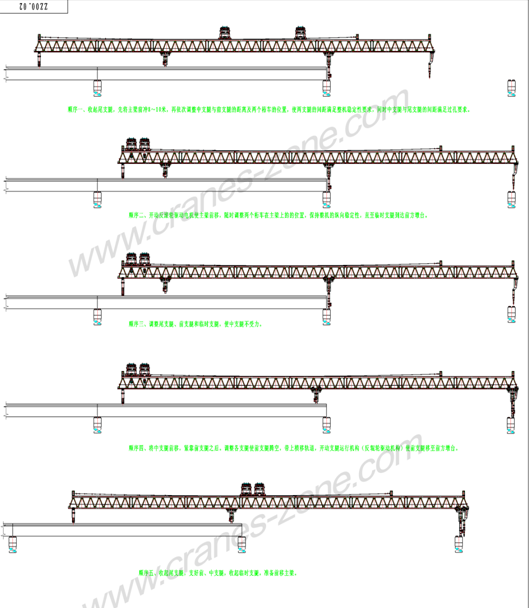 a) There is traveling rail together with main girder, trolley and longitudinal crane. So, it is no need to lay traveling rail more. In this way, a lot of auxiliary materials are saved and production time is also saved. b) ZHONGJIAN launching crane has higher working efficiency, with 6~8 pieces girder erection every day, based on enough concrete plate supplying, skilled operator and good condition at site. a) It is symmetrically designed. Two way girder erection can be realized without split and slewing at original place. b) Use one meter of hydraulic jack for front leg and rear leg. This design improves working efficiency, safety and flexibility largely. c) Erect skew bridge by inclined way. Apply rotary face flange to connect each mechanism and structure, to erect 0~45°skew bridge. Side beam can be positioned one time for over 320m curve radius bridge. a) Each structure is connected by pins and bolts to facilitate assembly. b) Normally one set of launching crane can be assembled within 7days. a)Our chief engineer Dr. Zhao is professional and very famous in China to design launching cranes. b)ZHONGJIAN brand launching crane is one of the highest market shares manufacturers in China, especially in Yangtze River Economic Delta, you can see our products everywhere. 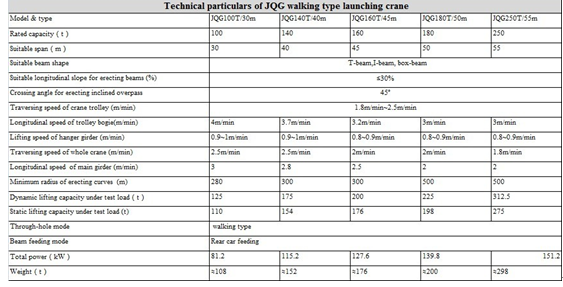 c)There is zero accident for ZHONGJIAN launching crane. 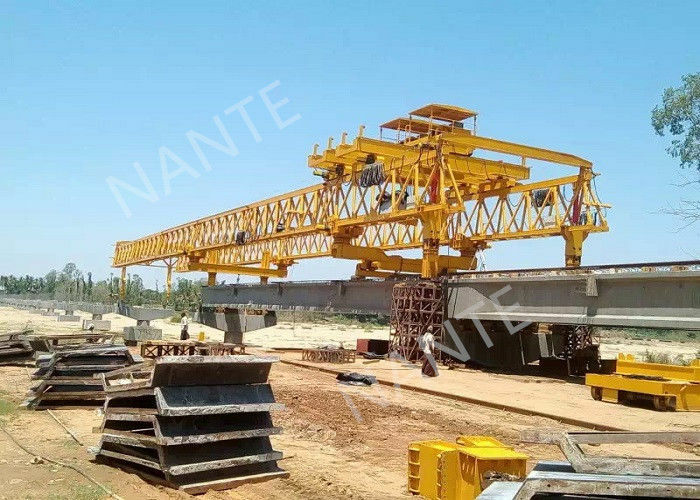 d)ZHONGJIAN brand launching crane have been used at various key projects, such as Hyning Railway, Hangzhou-bay sea span bridge, Minpu Bridge, Wenzhou Super large bridge, Jiubao bridge projects etc. 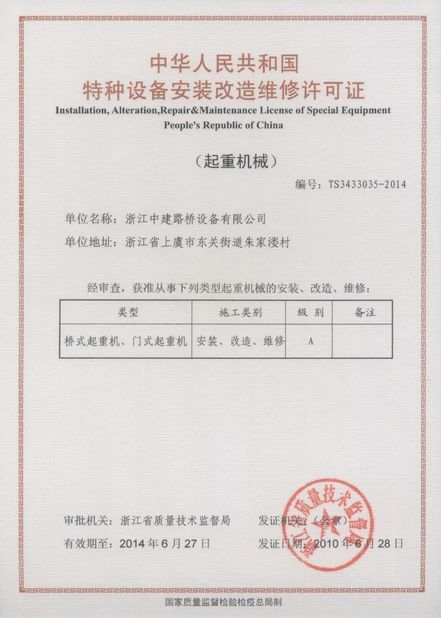 e) There are 17 years’ experiences in this field for ZHONGJIAN. Excellent employee personality, skilled production line and advanced production process are the most important guarantee to our products.